“Conventional wisdom has it that there are only two certainties to life: death and taxes. However, there is one main difference between them: You can cheat on your taxes. But the Grim Reaper will not be denied. All of us will die. This is a book for people who will die. But it is not only about death. It also concerns life, here and beyond” (9). Co-authoring this book with my good friend and colleague, Gary Habermas, was a little slice of heaven for me. We’ve known each other for 23 years, and we first met when I was a professor at Liberty University, which is where Gary teaches and helps to chair their philosophy and theology program. Gary has been writing about afterlife issues for some time now. It’s not surprising that he would have this interest and specialization either, since he’s a leading scholar and defender of the bodily resurrection of Jesus. In many ways, how could he not be an expert on the topic of immortality or “near death experience” (NDE)? I met a man who was dying of cancer (he eventually did die a few months after I met him) who couldn't stop talking about how much this book has helped assure him that life after death was real and how it helped him get ready to die. Accounts of that sort were a key motivation for us to write this book. As a reader, you may want to consider reading this book in light of someone you know who is dying or even trying to understand what it means to live. Perhaps that someone is even you. Our book is a meaty 450+ page discussion on a whole host of issues regarding the meaning and significance of immortality and how the Christian worldview makes sense of this reality. When the book first came out in 1992, and when the 2nd edition arrived in 1998, there really wasn’t much available on this topic from a contemporary evangelical philosophical-theological perspective, and especially with the scope of coverage that our book offered. 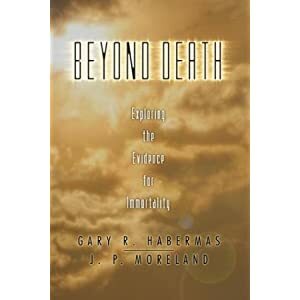 Now, several years later, while many other excellent books have been written on immortality, ours continues to contribute to this discussion, even if only some of our content has become dated (e.g., the scientific evidence for NDEs). Beyond Death is divided into three parts and seventeen chapters. Part one considers the issue of whether life after death is real and what rationale or evidence supports its reality. The second part explores what the afterlife is really like. In the last part, we seek to show how immortality in the hereafter can influence how we live here and now. Specifically, I wrote chapter 1 (“Some reasons to believe), and then the chapters on dualism (2-4), the intermediate state (10), hell (14), and end-of-life ethical decisions (17). Gary penned the chapters on the resurrection of Jesus (5, 6, 12), near-death experiences (7-9), reincarnation (11), heaven (13), the top-down perspective on life (15), and the fear of death (16). Gary and I were careful not to assume the truth of Christianity or the Bible in part one (we do make that assumption in part 2 and 3, though not without presenting some supporting evidence). Bottom line: we want our readers to realize that belief that immortality is real is not merely the result of having faith. We try to show that our beliefs about immortality are rooted in knowledge of what is real. It offers a comprehensive introduction and guide to the evidence for immortality, with special attention to relevant philosophical, theological and scientific discussions. It makes a helpful case for body-soul dualism in light of the evidence for immortality. It squarely deals with mistaken ideas about immortality (e.g., reincarnation). It is attentive to implications for ethics and spiritual formation if immortality is real. It relevantly integrates the benefits of contemporary Resurrection studies to this discussion. It offers smart and helpful theological-philosophical advice for dealing with objections to heaven and hell. The critic thinks if Galileo’s discovery of helocentrism can change doctrinal views of the church then we need to stay open to the idea our theories have the potential of being proven wrong. The critic has a problem with the dogma of seminary/church leaders on inerrancy.